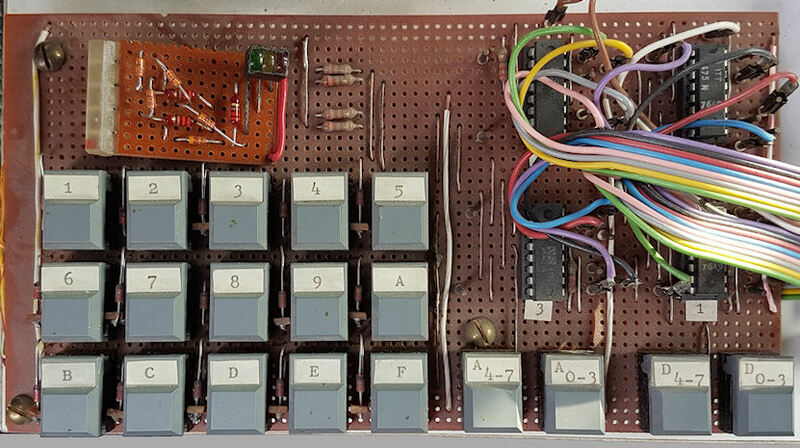 Peter's z80.eu site blog - Merry XMAS and a happy new year 2019 ! I wish you a merry christmas and a happy new year 2019 ! 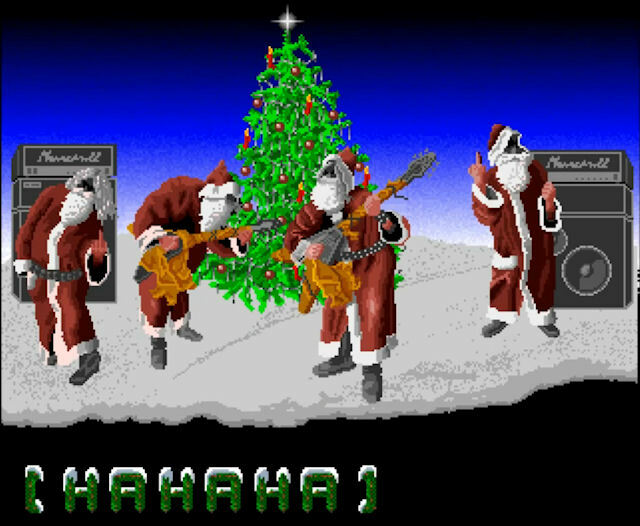 There are other Amiga demos which shows 3D effects and more, but not really XMAS related. Also, I've found an improved version of CPMLS (running on Windows). Take a look at http://www.sydneysmith.com/wordpress/2251/cpmfs-2-00/ to get more infos. It is crazy what can be done with QBASIC (for DOS). 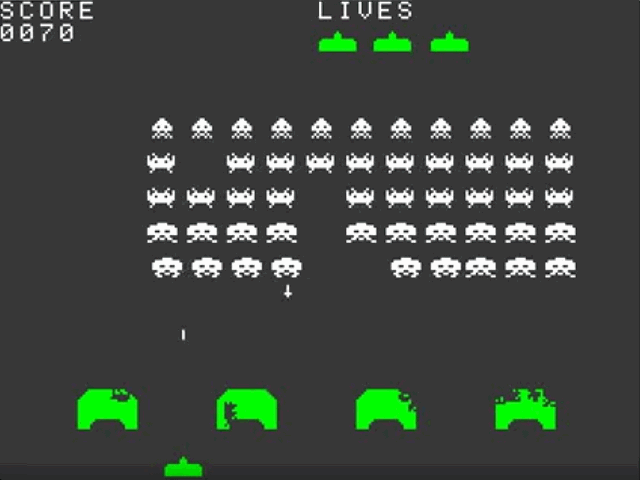 Even the "original" Taito Invaders game, having a *real authentic* look, can be implemented in QBASIC. While looking for GWBASIC samples, I found also some QBASIC samples. This one was the best one I ever found. It runs with any VGA (screen mode 13). 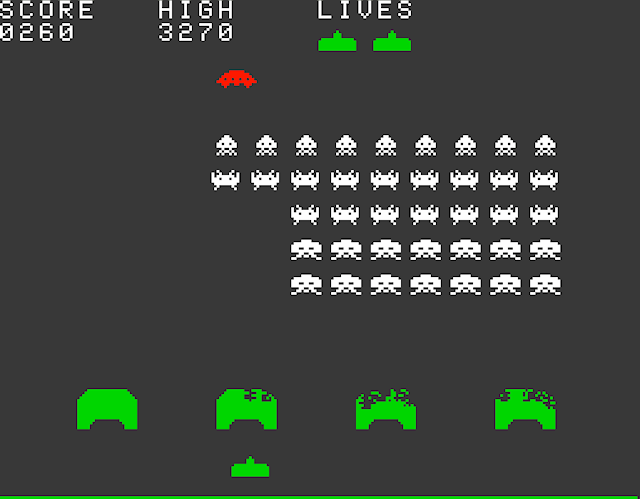 It was the result of a competition in mid-1996 for retro arcade games written in any version of BASIC. You can download it from the referenced page (related link at the bottom). Take also a look at the other programs James Eibisch published on the referenced "related link" page. Today I want to show you a meanwhile really rare ECB Z80 system from 1982. 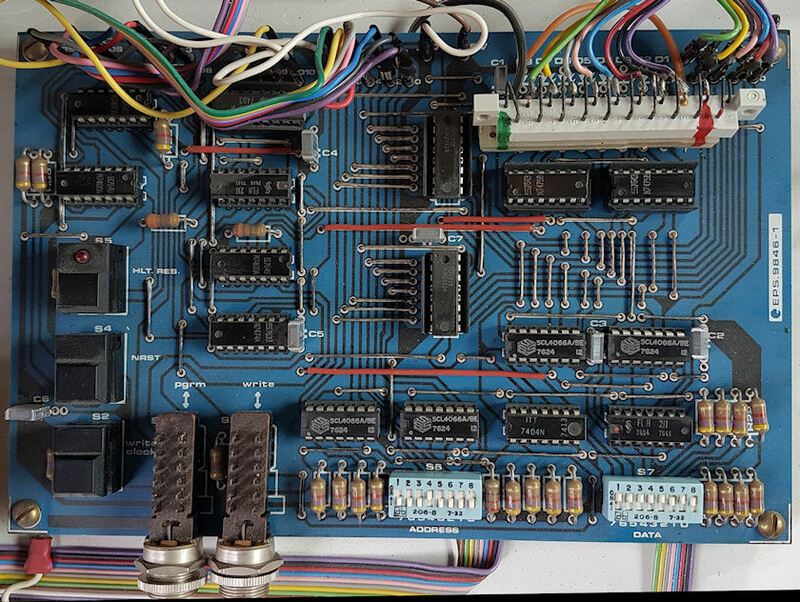 It has a ECB-backplane, so many ECB-cards (like the important Z80 CPU Card, the RAM and the FDC-card, and last but not least also a VIDEO-80 (terminal) card) can take place. The systems exists also in a desktop case, but this one has a "portable" case from Schroff. Portable means, it has a handle to carry it, but it's unexpected heavy (~20 Kg). The Z80 CPU runs with 4 MHz, and it has at least 64KB RAM (you can add more) and two quad density floppy drives with 800KB storage capacity. Usually it runs with CP/M 2.2, which is not extraordinary for an ECB system. I got the system with a broken power suppy and I had not enough space and also not enough time to repair and run it, so I swapped it against two Microprofessor MPF-1(B) with someone which has space and time enough (I can ask him if you like to exchange infos/expirience etc). If you look (=google) for further infos about this system, you will not find so much helpful. If you're looking for a system disk, I can send you a TELEDISK image file. Related link points to the wikipedia entry for ECB. The related link points to the Elektor site with the related article overview. Somebody told me his father had experimented with the SC/MP processor many years ago, so I pleased him to look after this again. He found the "archived" boards, and now he handed over this to me. This is great, because the CPU is already about 43 years old, and very rare. I will try to make photos from it, and also to run it again. 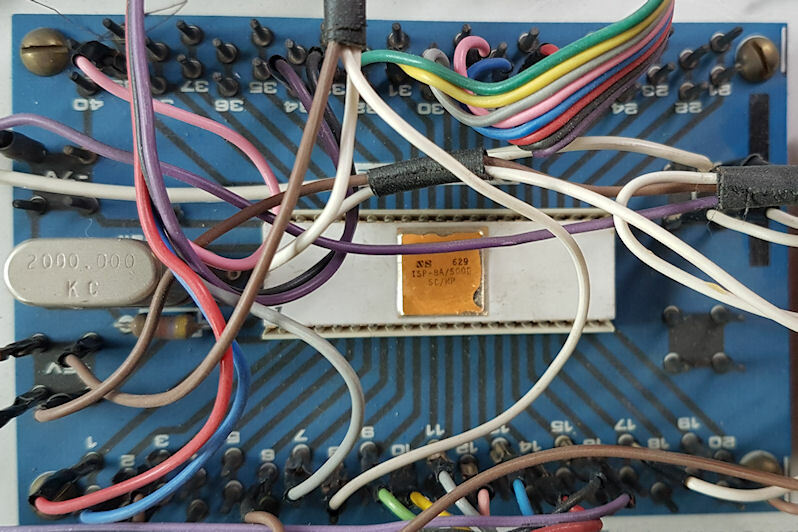 Unfortunately the first thing I have to figure out is what happened with the power supply, which looks a bit exotic and perhaps the capacitors are already died, too. 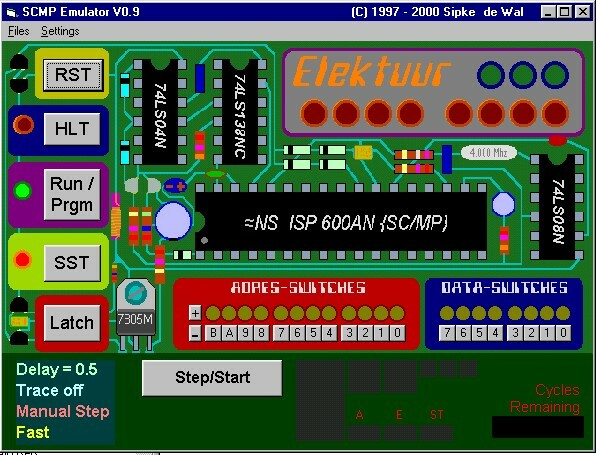 While looking for documents about the SC/MP, I found some hints about a website, which offered also an emulator. Unfortunately the author of the website, Sipke de Wal, already died in 2004. But the emulator can't be downloaded anymore (written in Visual BASIC 6.0), so if anybody knows where to find "Scmp09.zip", plz inform me. Some other sites also referring to SC/MP related informations, see related link.